An introverted novelist, trying to make it in an extroverted world. Finish Line, a photo by andrew_mo on Flickr. I did it! 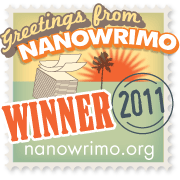 I won NaNoWriMo. 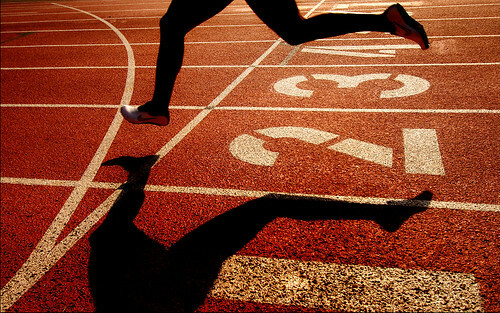 But, just like any good race or contest, my victory is riddled with scandal. The numbers don’t quite add up and when it comes down to technicalities, I cheated a little bit. This sounds like a dumb, arbitrary rule, we know. But bringing a half-finished manuscript into NaNoWriMo all but guarantees a miserable month. You’ll care about the characters and story too much to write with the gleeful, anything-goes approach that makes NaNoWriMo such a creative rush. Give yourself the gift of a clean slate, and you’ll tap into realms of imagination and intuition that are out-of-reach when working on pre-existing manuscripts. Outlines and plot notes are very much encouraged, and can be started months ahead of the actual novel-writing adventure. Previously written prose, though, is punishable by death. I broke this rule with reckless abandon. I had already written 89,722 words over the course of 4 years. But, (I will continue with my cavalier attitude, it is all I have left.) I may not have started my novel on November 1st but I did write 50,000 additional words and finish said novel in 30 days. My goal was to reach 139,722 words and I surpassed that by reaching 146,068 words. The numbers did get a bit muddled. The daily tally I kept only had me reaching 51,548 words while the document word count claimed I reached 56,346. It’s safe to assume that the actual number is somewhere in the middle. Either way, I did it. It’s impressive, I know. But wait, there’s more. I can also print a fantastic NaNoWriMo winners certificate to hang on the wall next to my College diploma. Oh, and I can now say that I have written a book. That’s pretty fantastic. A special thanks to: You, for reading my blog and cheering me on. The incredible virus that has been running rampant through our household causing me to be quarantined in my apartment for practically the entire month. Steven Burns and his puppy Blue, for entertaining my sick little boy. Michael, for never complaining when he had to make dinner again. The schnauzers, for attacking the dust bunnies before they grew large enough to eat us all. Dan, for telling me about NaNoWriMo. And finally, my Uncle Aaron, for being the first person to tell me that I could grow up to be a writer, if I wanted to. hey there novelist. now i can formally refer to you as Tara, my friend the novelist.. 🙂 congratulations on your triumph and discipline!